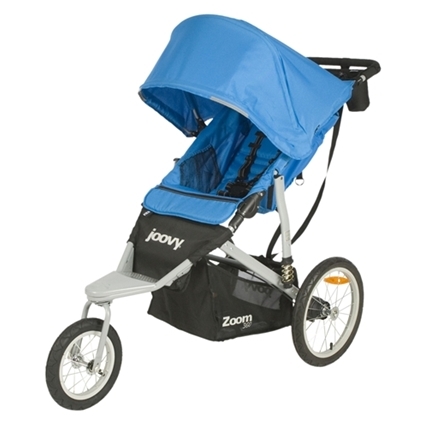 This is the summary of consumer reviews for Jeep Liberty Sport X All-Terrain Stroller, Sonar. The BoolPool rating for this product is Good, with 4.00 stars, and the price range is $160-$190. 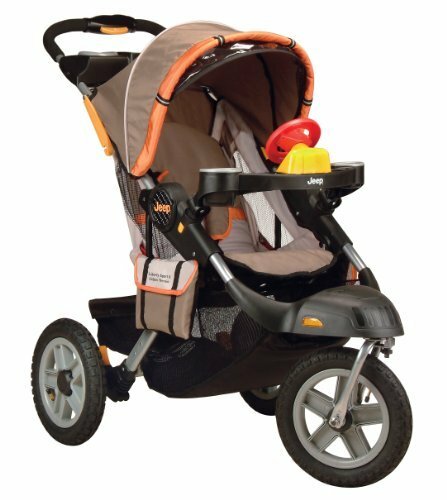 Jeep Liberty Sport X All-Terrain Stroller features a convenient one-hand and self-standing fold design that works great for farmer's market trip, or morning runs. The three-wheel all-terrain design features 12-inch inflatable tires and easy-swivel front wheel locks for tackling uneven surfaces with ease. The large basket and 2 removable cargo bags offer plenty of easily accessible storage. 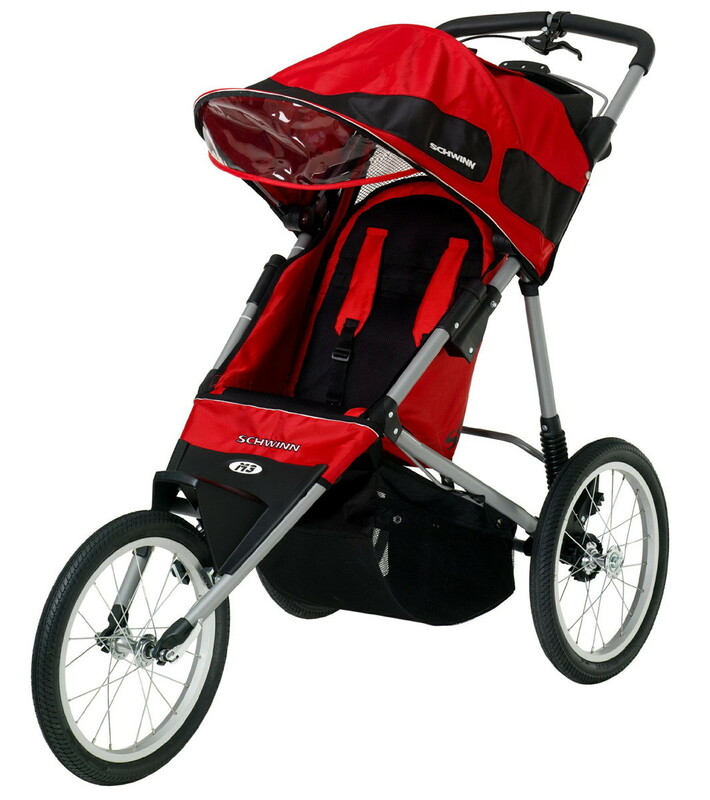 The stroller is easy to push, turn and maneuver and stands these test in all terrain. It is easy to assemble. The latest Jeep Liberty Sport X fits over 15 different infant car seats. It includes a removable child tray with dual juice box and a cup holder that goes on and off for snacks. This stroller also comes with 2 parent cup holders in convenient spots. Toy steering wheel and horn keep baby entertained. It features a multi-position reclining seat that is designed to accommodate kids up to 40 lbs. 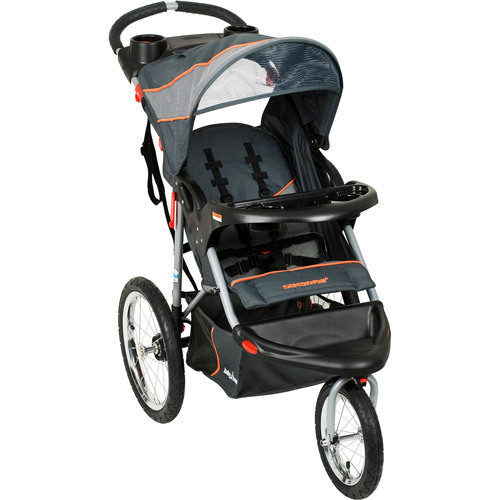 It also features a five-point harness for safety and a fixed canopy for sun protection. It can be heavy to fold and a little bulky to stow in smaller trunks or cars. Some users faced problems with rear tire blowing up and had issues in getting it fixed or replaced through the company. 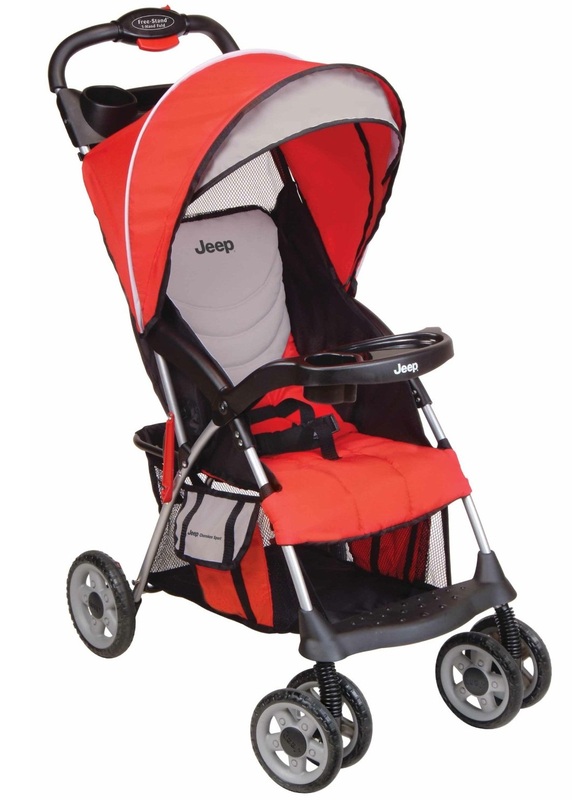 Overall, the Jeep Liberty Sport X All-Terrain Stroller provides a safe, smooth and comfortable ride over grass or bumpy terrain without any difficulty. 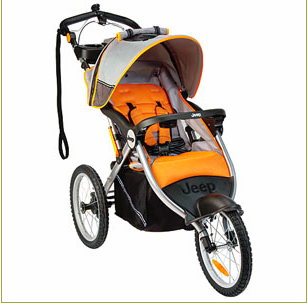 It is a great outdoor walking stroller that allows many car seats to fit easily and make it a functional travel system. 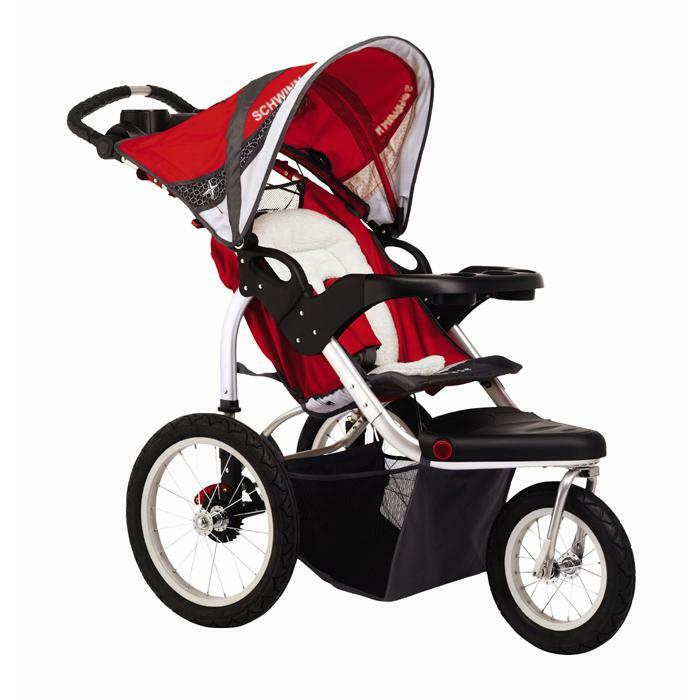 And the front wheel swivels, making this stroller perfect for walking outdoors. * The front wheel can switch between swivel and fixed. The front wheel isn't removable. 3) There's lots of room to stash a large diaper bag, Baby Bjorn, shopping bags, etc. There are also 2 storage bags on the side, which will be nice for keys, toys, papers, etc. 4) It'll be nice and roomy with a nice footrest once our child gets older - plus the steering wheel toy is a fun addition. 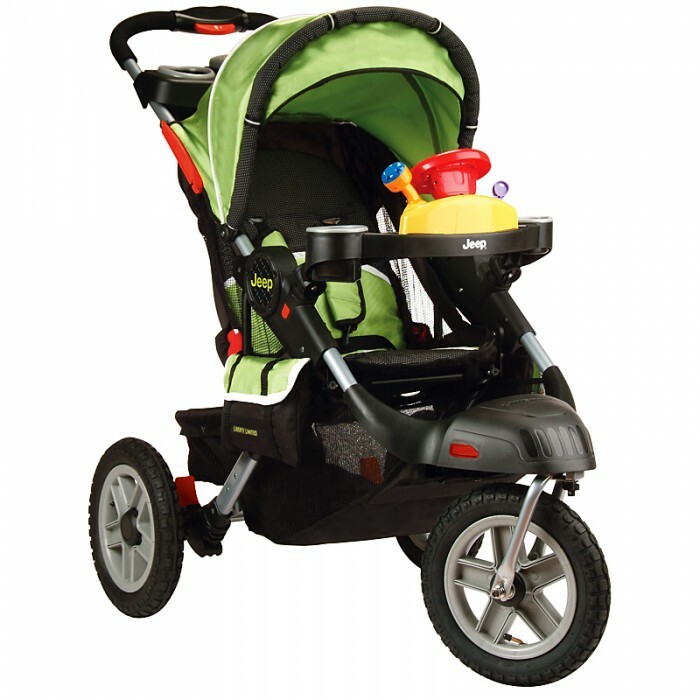 The wheels are comfortable and easy to push and the option to lock the front wheel is handy. Once my son learned how to use the steering wheel and horn, he loves this feature. My 16 mo old daughter loves the little steering wheel and there's a what I call 'catch all' compartment. It fits 10 different car seats! the front wheel can be locked straight or free to move. it fits my chicco keyfit 30 carseat perfectly!!! Lots of room for child. Not super heavy, just sturdy, hope to have a lot of use. Lots of storage space for hiking or shopping, and it's easy to adjust the seat back or break down one handed. Heavy to lift into car (I'm 5', 108lb). I bought this stroller before my first child who's 20 months old now was born. I purchased this item at my local Sears store about 2 weeks ago to go walking on the river trail with my 23 month old son. After 6 uses, the seat has ripped in 2 places!! On a side note, I've taken the stroller to the mall, but it's a little heavy as others have mentioned. big enough for a 16 months old baby boy. There isn't a way to tighten the harness strap that goes between babies legs to help prevent this and the back rest and seat aren't cushioned at all for babies comfort. It's a very good stroller; I know my baby is safe in it like it very much..just have in mind that's bigger than other strollers so better to have a big car with good trunk!. i live in alaska, where the roads aren't paved, and not sure if they ever will be, but even if they dont get paved, i'll be comfortable taking my baby around in this thing. My God daughter is a longtime jogger, she needed this so after the baby is born she could continue. I don't think the assemble rear wheels are safe. it's a multi-purpose and it helps her with different things. Their infant car seat fits perfectly. The car seat fits perfectly in the stroller. Very nice and Smooth riding stroller , almost any car seat will fit and lots of storage room, easy to put together with nice fit and finish. One huge plus, is that our Chicco car seat fits into it perfectly (though doesn't "snap" in). Designer infant car seat from safety first won't fit on this stroller despite website indicates it'll !. We purchased the stroller when our daughter was 1 month old and use it with our Chicco Key Fit car seat. One feature that can be improved is belt for infant car seat. I don't use this from the car - it's wayyy to big and not easy to break down for car to store use. However, this stroller is super heavy to fold up and put in the trunk of your car. nice easy to use stroller, love the front and rear under carriage access!! easy to assemble.This was a gift.It's sturdier than most jogging strollers we tested.they loved it. Smooth, easy to manipulate, comfortable! SHE LOVES THE MESH SIDES SO SHE CAN LOOK OUT, AND LOVES TO GO FOR HER STROLLER RIDES. My daughter loves this stroller, its great for harder/rockier areas. IT HANDLES VERY WELL ON ALL TERRAINS, AND I LOVE THE PADDED SAFETY STRAPS, THEY'RE VERY EASY TO BUCKLE AND COMFORTABLE FOR HER AS WELL. We live in rural Newfoundland so we cover lots of different terrain on our walks and the Jeep Liberty stands the test in all terrain, just love it. It's plenty of storage, is easy to push and is comfortable for the kids. I love this stroller in that I can go for a walk down my street with my 18 month old son & he's comfortable and *I* am comfortable pushing him along in it. It's goes up so easy and packs up easy too. The back tire tube blew on our stroller, and the only way to fix it was through a bike shop or to call Kolcraft. The product arrived in excellent condition, and even with a bubble in the rear tire, I called Kolcraft direct and it was replaced in short order. This product was never delivered. product lives up to expectations and representations. I was then told the tires were backordered 4 weeks. 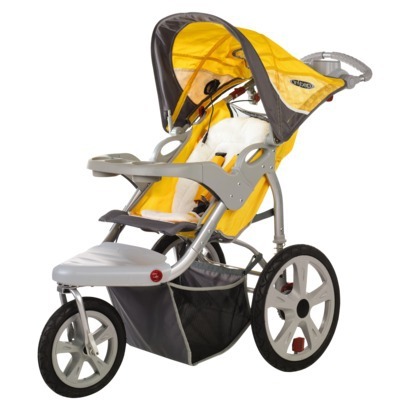 this item is good for warm weather,little wider than other stroller that we've! Bike shops weren't able to fix it, and the only way we could order through Kolcraft was with the model number...on our nonexistent tags.